He said: "The truth of the matter is that Nigeria spends about one billion dollars annually on importation of fish. Because of our fish production deficiency in Nigeria, we want to increase the number of people who have the knowledge and skills to farm fish. The intention of this vocational training is to increase fish production. "There are two ways to approach it: to increase production by increasing the number of people into fish production; to genetically modify the fish for productivity. 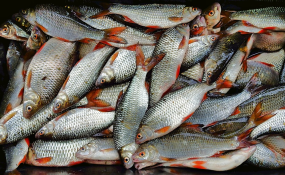 "The metric tons of fish production in Nigeria are below the demand and consumption of fish and so we are still at the infancy in popularising fish production".